"As we inhabit the Gospel story for now, we will always be shaped by the faithful community who gave that story to us. Heritage is part of our mission because it is in our roots, that our strength and nourishment are found from it, as surely as a tree stands open to the bright light of the day only because of its firm anchoring in the ground." Remember to 'Like' our page. 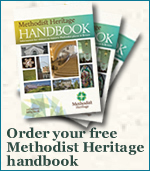 If you would like a 'live' Methodist Heritage Twitter widget for your website or blog copy the code below.